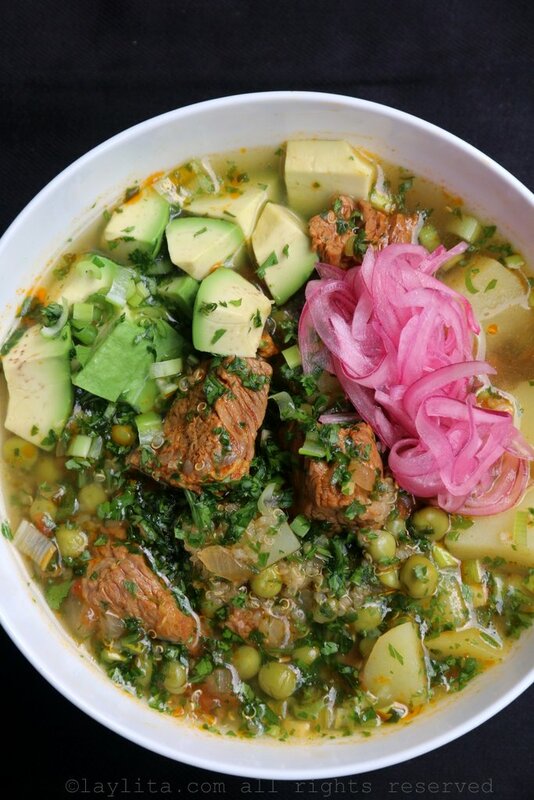 This quinoa soup with beef recipe is a comforting Ecuadorian soup made with onions, garlic, tomatos, cumin, achiote/annatto, beef, potatoes, peas, parsley and cilantro. Growing up, way before quinoa became cool, my mom would add quinoa to a variety of different soups she made. The quinoa adds consistency and makes the soup more filling, in addition to to the good for you part. As a kid I wasn’t a fan of plain cooked quinoa and having it in a soup helped give it more flavor, plus I loved the way the quinoa almost pops when you eat it. I though it made the soups a little bit playful and fun. 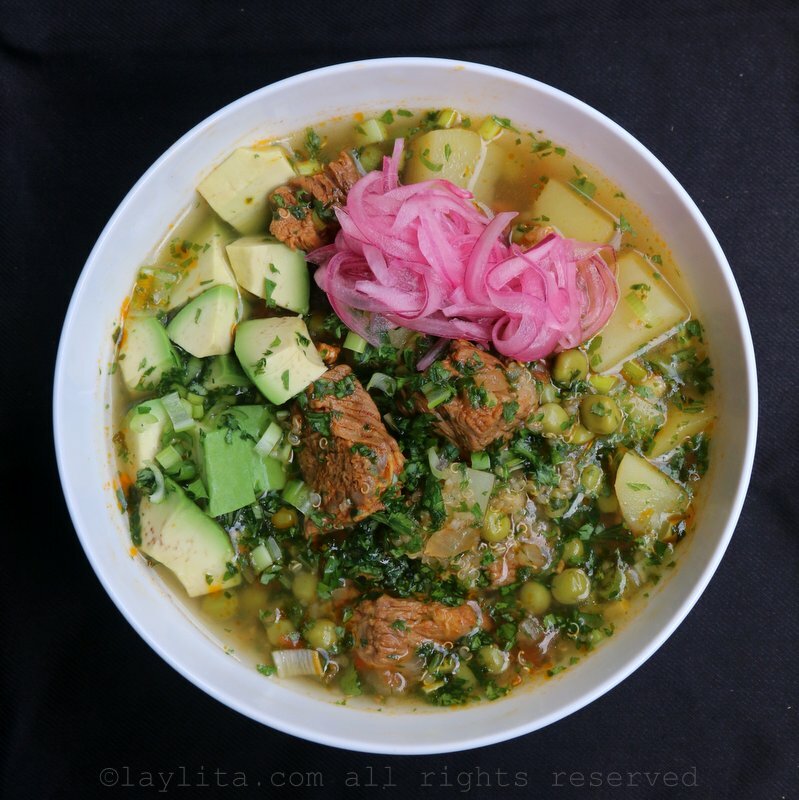 Easy quinoa soup with beef recipe made with onions, garlic, tomatoes, cumin, achiote/annatto, beef, potatoes, peas, parsley and cilantro. 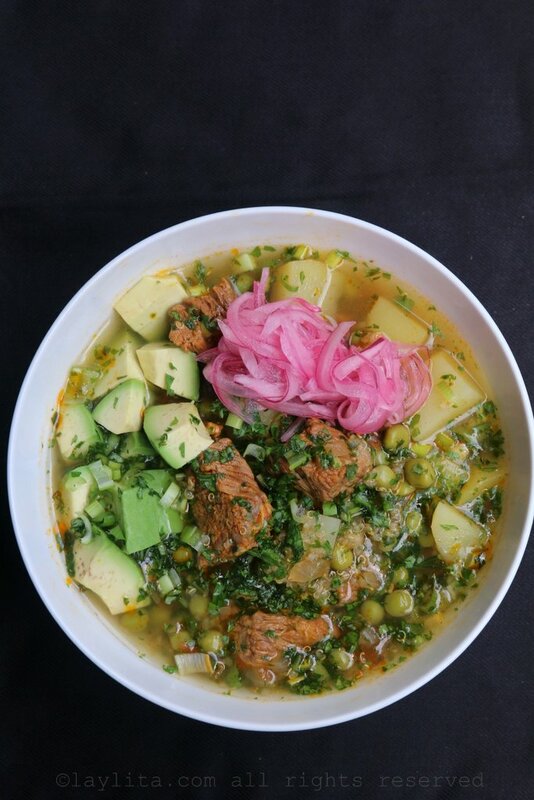 Served with avocado, pickled red onions, and hot sauce. Melt the butter or heat the oil over medium heat in large soup pot. 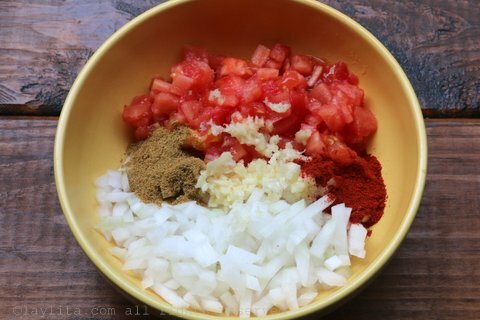 Add the diced onions, minced garlic, diced tomatoes, achiote or paprika powder, cumin, white pepper, and salt. 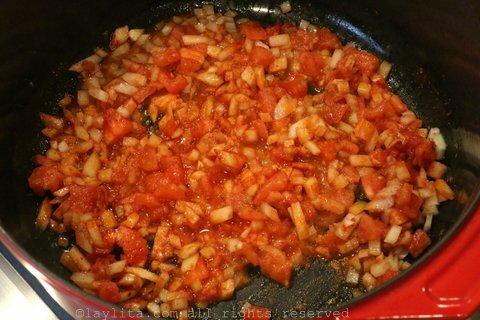 Cook for about 5 minutes or until the ingredients are softened, stirring often. Add the pieces of beef, mix until well coated with the sauce, and cook for about 5 minutes. Add the water and the beef bones (if using), increase the heat to high and bring to a boil. 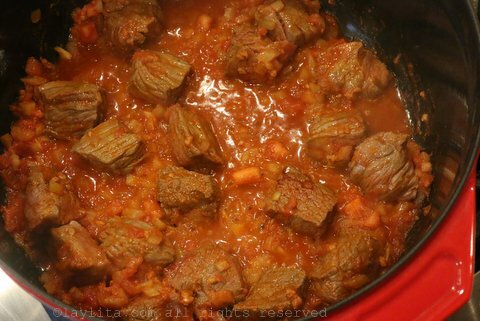 Reduce heat to low and cook until the meat is tender, about 45-60 minutes. If using uncooked quinoa, add it after about 30 minutes. Add the potatoes, peas and cooked quinoa. 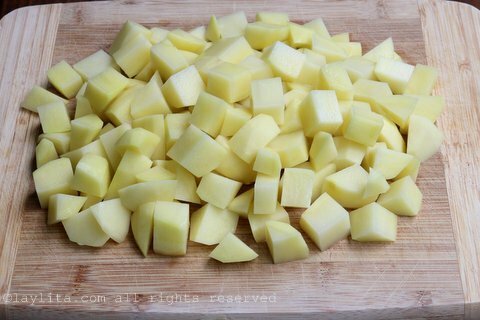 Reduce the heat to low and simmer for about 25-30 minutes or until the potatoes are tender. Use a slotted spoon to remove the beef bones from the soup. Add the chopped parsley, chopped cilantro and chopped scallions, taste and add salt/pepper if needed. Serve with avocado, pickled red onions, and aji or hot sauce. 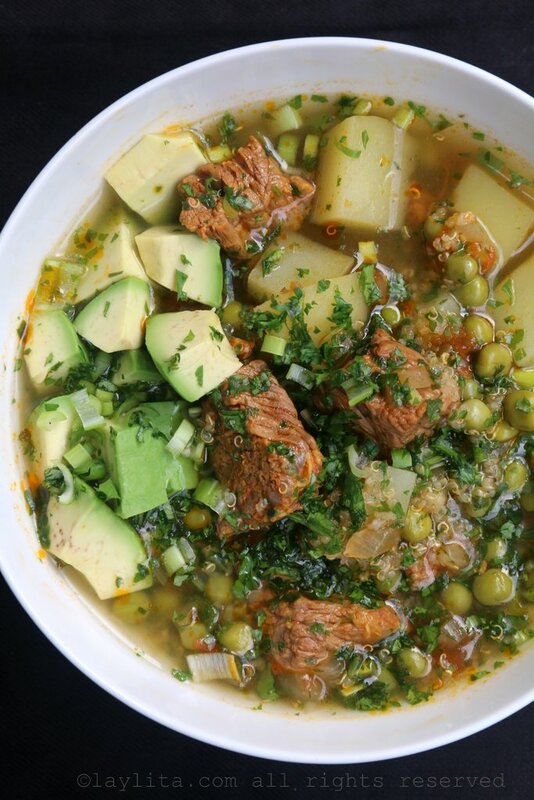 This quinoa soup can also be made with pork or chicken instead of the beef. Additional vegetables can be added/replaced based on your preference. 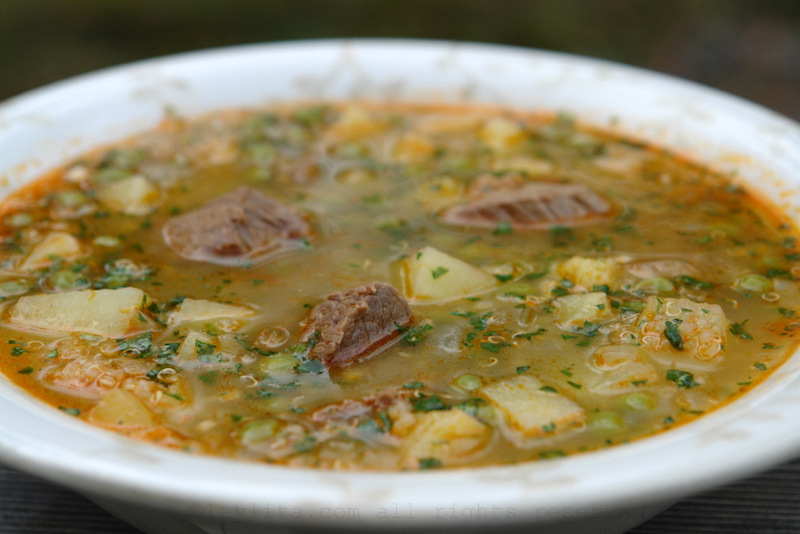 There are many options to make soups with quinoa, one of the more traditional Ecuadorian quinoa soups is made with potatoes, milk and cheese and has a very creamy consistency, similar to locro de papa potato soup. 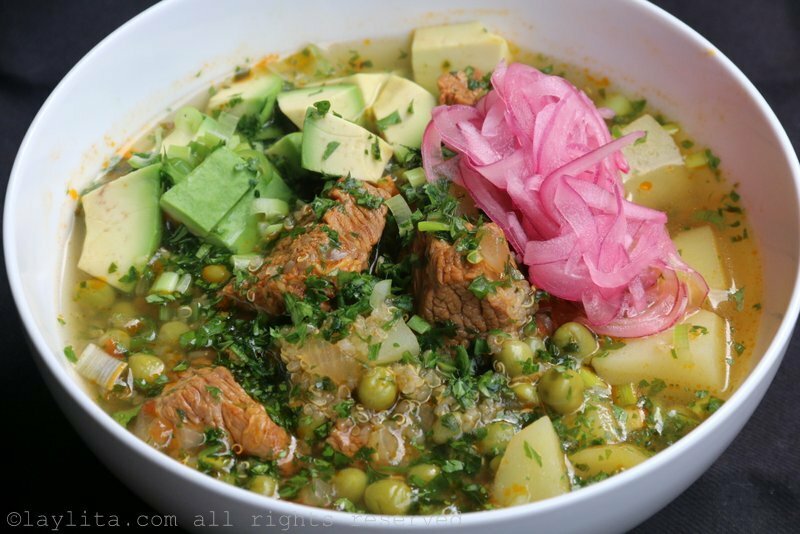 This recipes is a lesser known soup that is made with beef, potatoes and peas, and is similar to Ecuadorian soups made with other grains such as barley/oats/cracked corn. 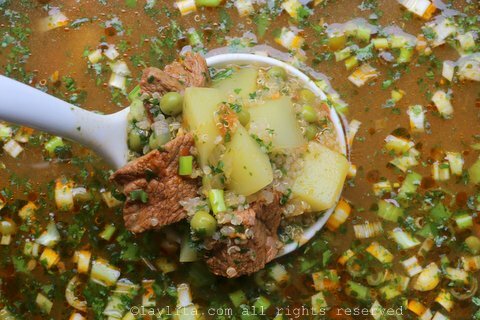 In this quinoa soup with beef you can either use previously cooked quinoa or add it uncooked, I prefer to add cooked quinoa (at the same time as the potatoes are added), but if you want to simplify you can add the uncooked quinoa about 30 minutes after the beef is simmering. 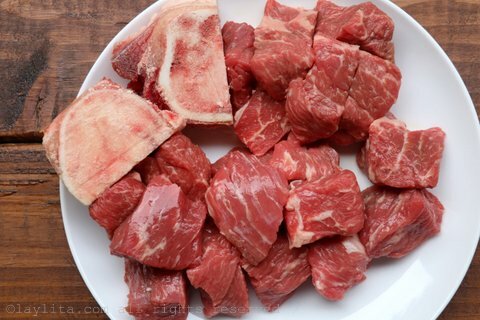 The soup can be made with just plain beef (beef stew pieces/top round) or for extra flavor, you can also add some beef bones to the soup and remove them at the end. 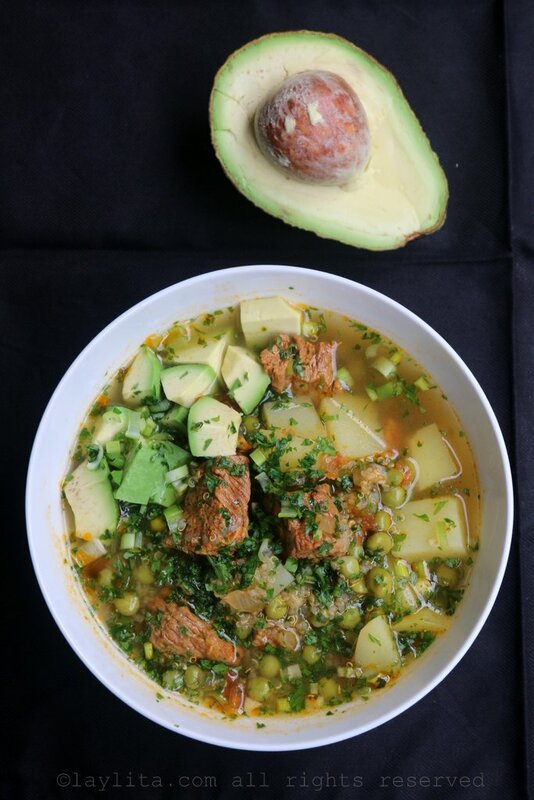 You can also easily customize this soup and add additional vegetables, and also make using pork or chicken. 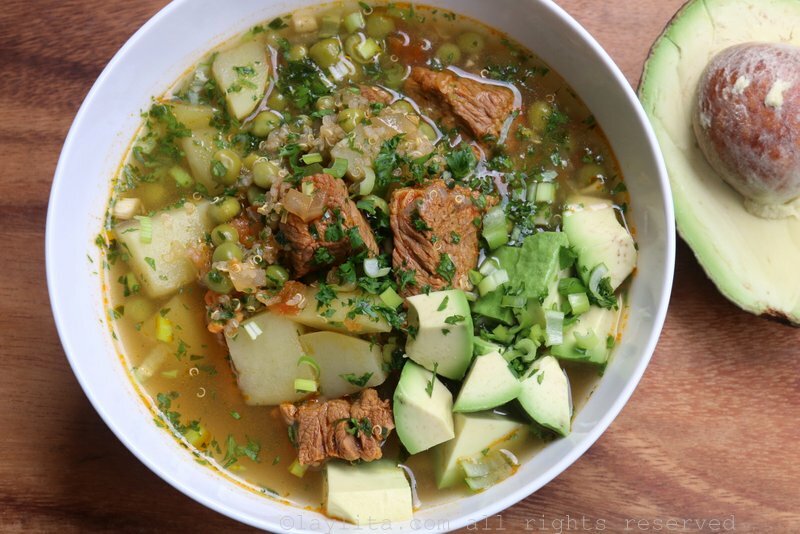 I like to serve this quinoa and beef soup with avocado (of course! ), some cebollas encurtidas or lime marinated red onions, and aji hot sauce. Just made this the other day — what a DELICIOUS soup!! Made this soup today and it was super delicious and so simple! 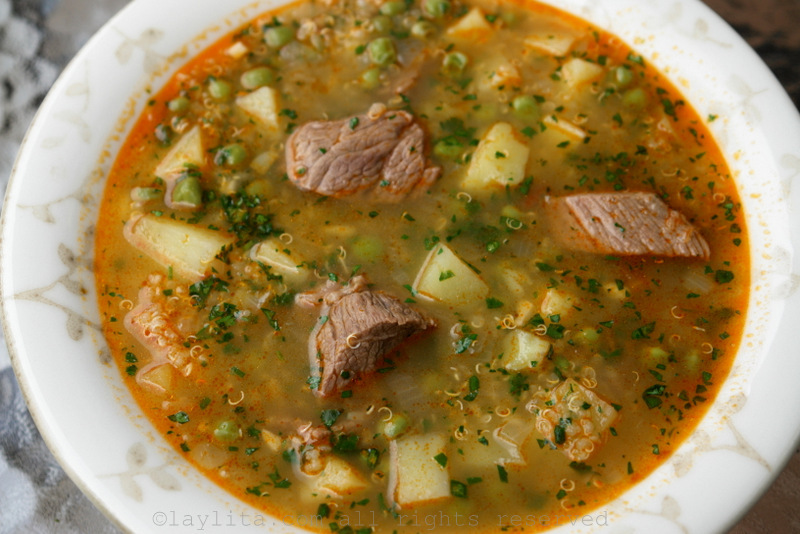 I boiled the meat first by itself to skim off the impurities and leave a clear broth before adding the seasonings and then the yellow potatoes which are so great in soup! I served it with crumbled Feta and aji. Total hit, delicious!!! Thank you for this great recipe! I am so excited to try this! I’m having a baby in about a month and trying to stock the freezer with delicious foods. I almost hate to freeze it, but I’ll have to make some for before and after the baby comes. Sounds delicious and filling! Hi Laylita! I come from Quebec. 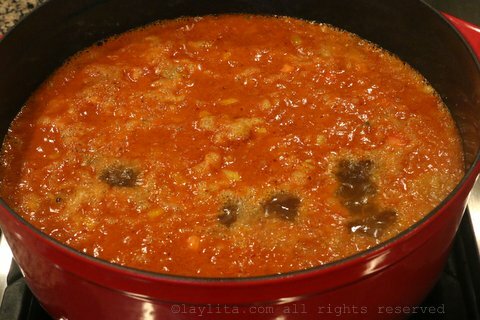 I make this soup for our lunch today, my kids and me love it! Quinoa in soup especially with beef it’s tasty and beautiful, thank you for idea. 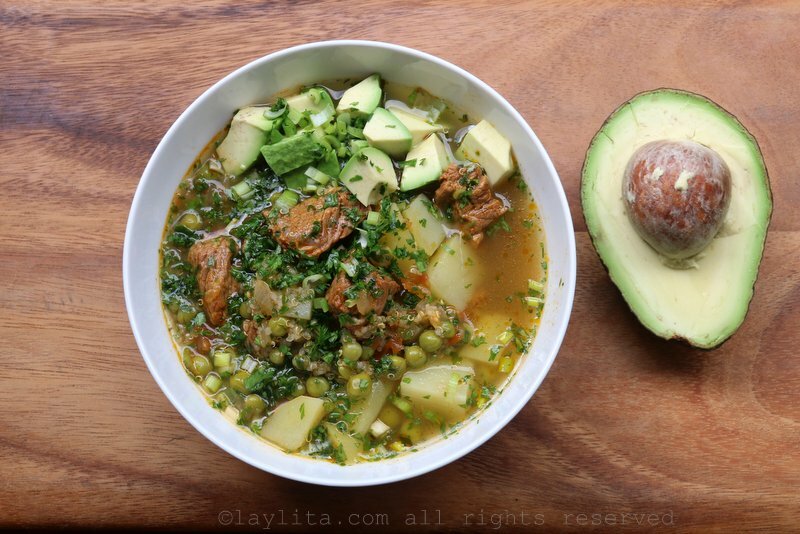 I made this recipe yesterday and I had so much that I gave some to relatives (my husband’s family) and they are Bolivian-American. Some of the relatives had recently come to visit here in MD…anyway…they all reported to my husband that they LOVED this recipe. I added some veggies to it (carrotts, celery and red pepper) because I am trying to get the hubby to eat them. Thanks sooo much. I will definitley add this to my cooking repretoir. This looks so good I’m going to serve it as a special at the restaurant where I work tonight. Muchas gracias. What beautiful food. My family and I thank you for this wonderful recipe. The aji is delicious too, we made ours with four serranos.